Gather, learn, access. These are three endeavors of college students everywhere. Fronting the Santa Clara, Calif.-based Mission College, a new student engagement center (SEC) strives to do this for its 8,000 students. It’s a welcoming new gateway to the college enhancing community connections and renewing a sense of place. A landmark project for the campus, it revamps the entire entry and is the campus’ first project undertaking of this scale under the construction management multi-prime (CMMP) delivery method. The center, along with a previous project, replaces the campus’ demolished 235,066-square-foot main building built in 1979 and helps create an open space for an interdisciplinary plaza. “Our main goal of the SEC is to have all of our student services in one, easy-to-find location, which we accomplished on the first floor,” says Niall T. Adler, spokesman for Mission College. Designed to offer centralized student services with a one-stop shop approach, it includes admissions and records, financial aid, a career/transfer center and a welcome center. There are also instructional spaces for community education, group study areas, skill labs and faculty offices. To accommodate student activities and foster a sense of community, the space has a unique flow to encourage students to gather, blurring the lines between the indoor and outdoor learning environments. 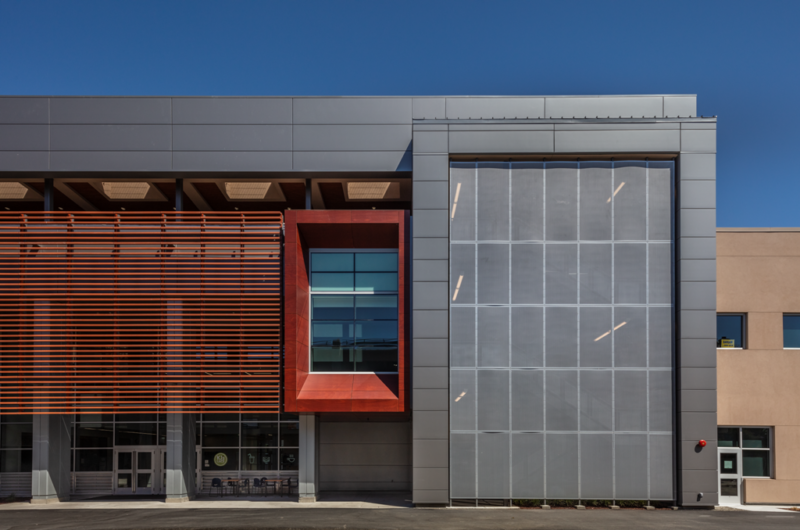 Designed by Sacramento, Calif.-based Lionakis, with a “moth to the educational flame” concept, the three-story, 101,000-square-foot center is slated for LEED Gold certification. 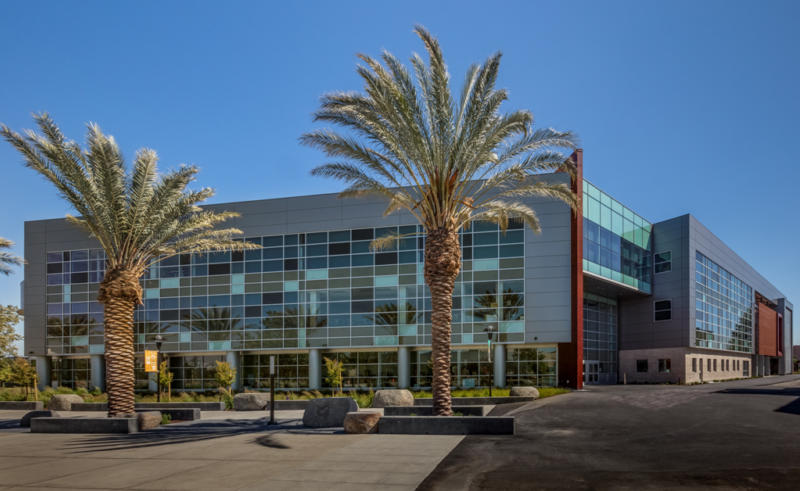 Providence, R.I.-based Gilbane Building Co. was engaged by the West Valley Mission Community College District to manage SEC construction using CMMP delivery and it managed 22 prime contractors. Under a CMMP delivery, the owner has more financial control over a project. The construction manager assumes no financial risk. The owner chooses the contractors based on several qualifications and not just project price. “The SEC was the District’s first project undertaken that used a delivery model other than the traditional low-bid, design-bid-build process,” says Glenn Rock, project executive at Gilbane. “Although there was a learning process around process and procedures at the beginning of the project, together the District, Lionakis, Gilbane and the numerous prime contractors delivered the project on schedule and with cost savings not realized through the traditional design-bid-build model.” The SEC’s metal installer was Gardena, Calif.-based BEST Contracting Services Inc. and the fabricator was Olson Steel, San Leandro, Calif. The gateway required real design ingenuity to achieve. "Our vision was to design a unique facility that focused on the student experience while creating a new front door for Mission College to the greater community," says Dennis Guerra, associate principal at Lionakis. This vision was accomplished via a façade and glazed curtainwall from CENTRIA, Moon Township, Pa. 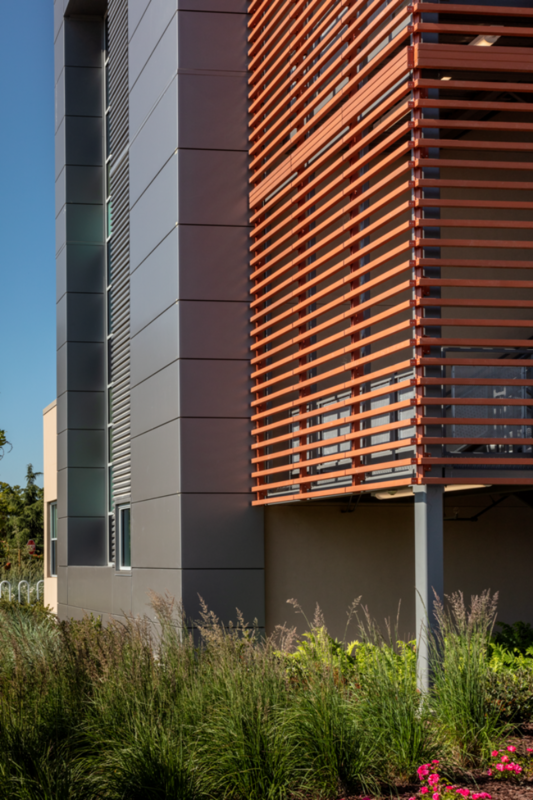 It is comprised of 24,724 square feet of CENTRIA's Formawall Dimension Series 3-inch insulated metal panels in Pewter with a smooth finish and pearlescent Sundance Mica coating, and 2,423 square feet of DS60 panels in the same color, coating and finish. The DS60 profile provides unique visual interest on the building exterior. Formawall contains zero halogens, and also provides thermal efficiency and moisture control. Additionally, CENTRIA’s EcoScreen single-skin, perforated screen wall was used on the main public frontage of the building. Designers at Lionakis chose to create a light, airy aesthetic to suggest movement, and to also help conceal more industrial components of the structure. Red phenolic panels from Prodema, Guipuzcoa, Spain, also accentuate the center’s entrance and Guerra says the way they interface with the CENTRIA panels was simple and effective. “The CENTRIA system presented no real design challenges due to the wide range of trim and flashing components available allowing interface with adjacent cement plaster or curtainwall assemblies,” he adds. The center’s structural steel is Pleasanton, Calif.-based ConXtech Inc.’s mass-customizable, modular, prefabricated structural steel building system. The innovative, tapered connectors were shop welded to the steel members; on-site, the beams were simply lowered into place and bolted on the column connections. This “erector set” approach saves considerable time in the field due to reduced field welding, reduced piece count and the ability for subsequent trades to begin work earlier. Adler says that this modular building technique not only minimized the number of welds, but readily complies with state earthquake design standards. The ConX System is frequently used in educational settings in California, both because its connections are prequalified for seismic conditions and because ConX structures typically require no braces or shear walls, creating open and flexible spaces. The system is robust and well suited for facilities with significant loading from equipment, like science labs and health centers. The center was designed with a sustainability focus. The building incorporates extensive natural ventilation and highly efficient mechanical systems. Using recycled water throughout restroom fixtures and mechanical units creates a sustainable approach to water use. Drought-tolerant landscaping and active bioswales contribute to a significant reduction of potable water use. Roof-mounted photovoltaic panels provide hot water throughout the facility. Extensive natural daylighting and low- VOC materials provides an interior space, which is geared to high academic performance, while providing significant energy savings to the District.